Please note the change of dates for this event from September 23-25 to it’s new weekend of September 2-4. Sylvan Glen looks forward to welcoming you all to their industrious shire. You can find the updated event announcement below. 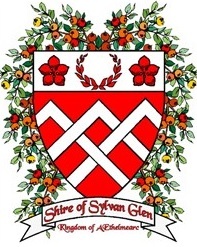 Unto to the populace of the Sylvan Kingdom does the Shire of Sylvan Glen send greetings! We invite all from near and far to “Go Berserk in the Glen” at the 21st Annual Siege of Glengary. Join us for a Viking invasion. Go Berserk in the Glen Siege will be held Friday September 2 – Sunday September 4 at the Jefferson County Fairgrounds – 1707 Old Leetown Pike Kearneysville, WV 25430. The site opens Friday September 2nd at 5:00pm and closes at 12:00pm on Sunday September 4th. Those remaining on site will be conscripted for clean up. Included in your registration: Camping, Travelers’ Repast (Friday evening), breakfast (Saturday morning), and a delicious dayboard (Saturday) prepared by Baroness Oddkatla Jonsdottir. A hearty Viking feast will be prepared by Lady Arianna del Vallone at $12 per person. Preregistration is encouraged as only a small number of seats will be available at troll. A separate child’s feast will be prepared as well by Lady Reina Dulce Dame (Jessica Knill-Lopez knilljlo@gmail.com) for $5 per child (ages 12 and below). Please call or email with questions. We hope to see you there!